View More In Specialty Tools & Gadgets. a poached egg is using a cozilife egg poacher. the best design. A ring stander provide stability in boiling water and in microwave oven. after oiling.The egg our product make is evenly cooked and tasty than ever. make sure you enjoy poached eggs made by our poacher. The 'perfect' poached egg has a runny yolk, with a hardening crust and no raw white remaining. ★Premium Quality Silicone with Long Lasting Surface Processing Technology★ FDA approved, BPA free, food grade silicone. Eco-friendly and non-toxic.Temperature tolerance: -40℉ to 405℉（0-230℃）. ★Make Perfect Poached Eggs with Simplicity★ Using spray oil before poaching in order to get a better non-stick experience. During cooking, the poacher stands on the pan and in the boiling water, protects the egg from the tumbling action of water while conducting the heat to poach the egg. The egg is evenly cooked, you can watch and decide how you want the egg. When egg rings are always a fail, try our poacher! ★The Egg Poacher is Multi-functional in Kitchen★ It can be used as cake, dessert, and jelly mold. It can also be used to melt chocolate, heat pasta source, and steam vegetables. And by extending cooking time, you can have hard boiled egg without shell from our poacher. ★We intend to provide the best service possible★ We won't be satisfied until all of our customers are satisfied. We offer unconditional returns or refunds. To live a cozy life, choose Cozilife. ★Desgin for Cooking, Use For Cooking★ Every set of our Egg Poachers has 4 different colors. An easy-to-pick hole is on every side of the product. It is easy to remove the egg from the soft silicone. To clean up, simply flip it over and wash it or just toss it into the dishwasher. The ring stander design makes it steady on any kitchen surface and it is also suitable for microwave use. The poachers are stackable and easy to store. These poachers save a lot trouble from egg poacher pans. 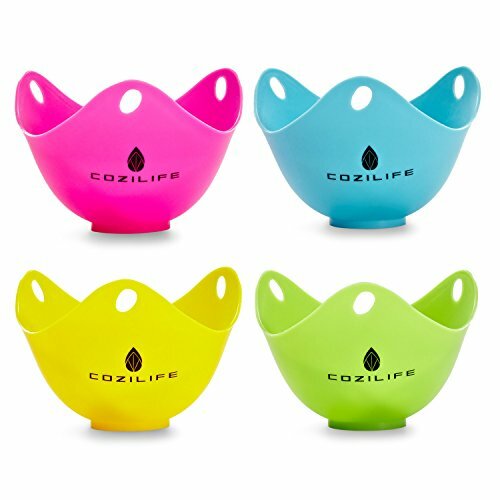 If you have any questions about this product by COZILIFE, contact us by completing and submitting the form below. If you are looking for a specif part number, please include it with your message.